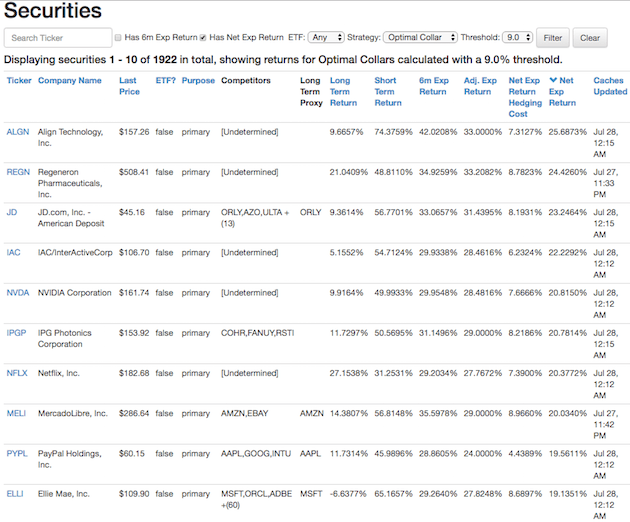 The 6-month performance of Portfolio Armor’s top names from July 27th. Since June 8th, I’ve been posting Portfolio Armor‘s top ten names each week. 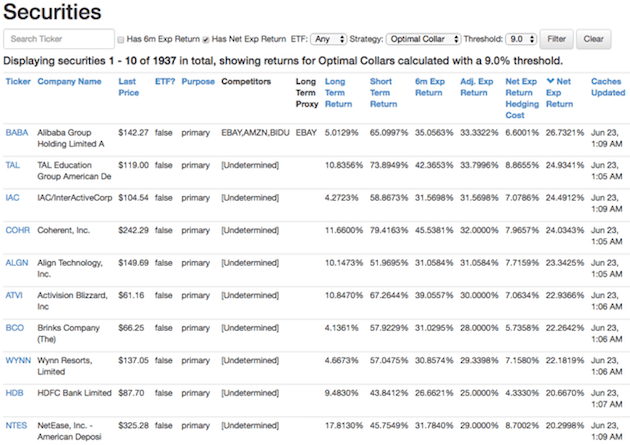 These names are ranked based on my site’s estimate of their potential returns over the next 6 months, net of hedging costs. 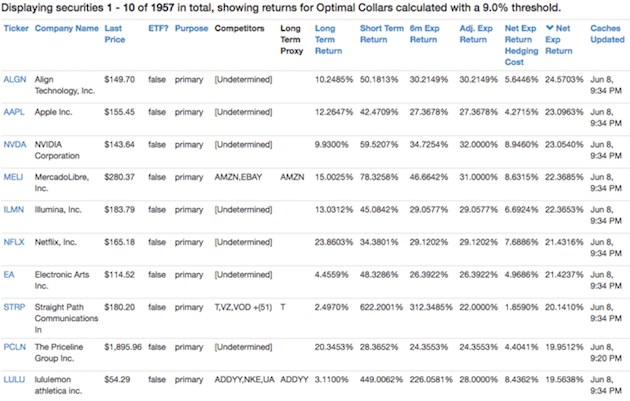 As of Friday, we have actual 6-month returns for the first 10 weekly cohorts. 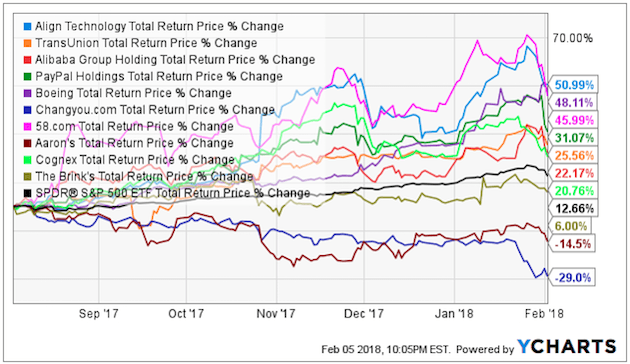 9 out of 10 of them beat the SPDR S&P 500 ETF (SPY), and the average 6-month performance of each weekly cohort was 21.13% versus 12.57% for SPY. This is further evidence that Portfolio Armor’s security selection method, which uses price history as well as option market sentiment, delivers alpha, as I elaborate below. Let’s look at exactly what the top names were each of these weeks, how that data was time-stamped, and how each name did over the next 6 months, starting with the June 8th cohort. 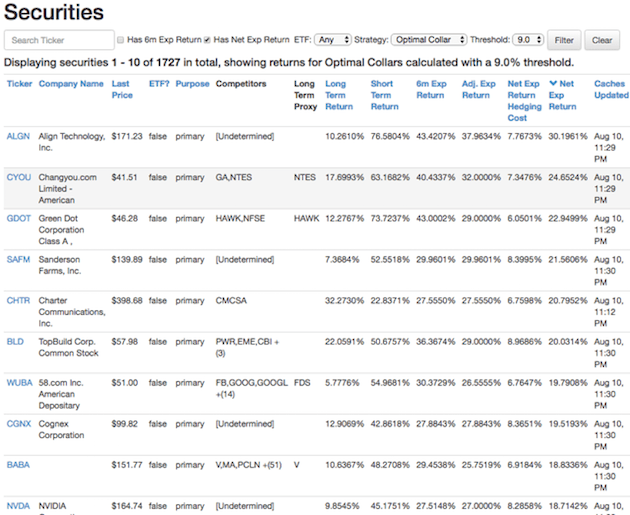 These were Portfolio Armor’s top ten names as of June 8th, presented here at the time: Align Technology (ALGN), Apple (AAPL), Nvidia (NVDA), MercadoLibre (MELI), Illumina (ILMN), Netflix (NFLX), Electronic Arts (EA), Straight Path Communications (STRP), Priceline (PCLN), and Lululemon (LULU). On average, the top names were up 8.78% over the six month period, versus 9.99% for SPY. 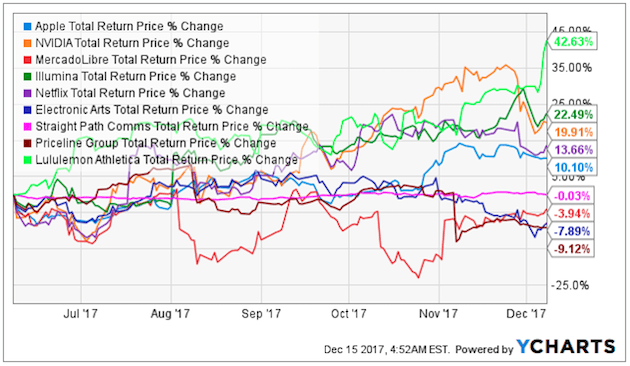 These were Portfolio Armor’s top ten names as of June 16th, presented here initially: Brinks (BCO), CSX (CSX), TAL Education (TAL), Activision Blizzard (ATVI), Lam Research (LRCX), IAC/Interactive (IAC), Nvidia (NVDA), HDFC Bank (HDB), JD.com (JD), NetEase (NTES). On average, the top names were up 19.75% over the six month period, versus 10.94% for SPY. 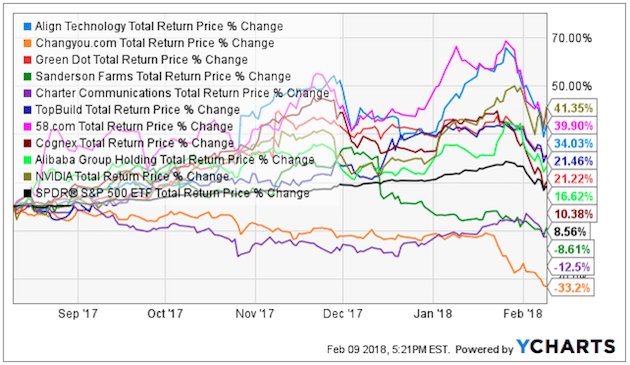 These were Portfolio Armor’s top 10 names as of June 22nd, presented here initially: Alibaba (BABA), TAL Education Group (TAL), IAC/InterActive (IAC), Coherent (CORH), Align Technology (ALGN), Activision Blizzard (ATVI), Brink’s Company (BCO), Wynn Resorts (WYNN), HDFC Bank (HDB), NetEase (NTES). On average, the top names were up 24.46% over the six-month period, versus 11.27% for SPY. 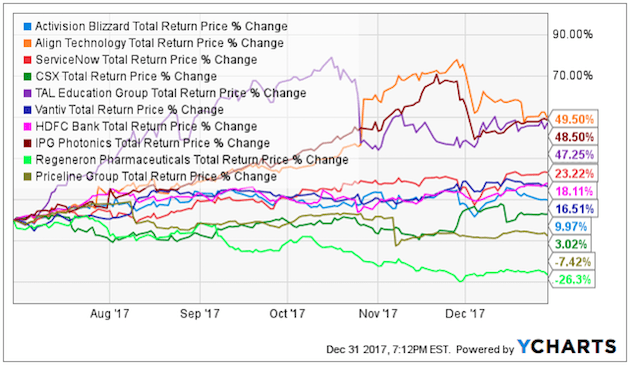 These were Portfolio Armor’s top 10 names as of June 29th, time-stamped here on Twitter: Activision Blizzard (ATVI), Align Technology (ALGN), ServiceNow (NOW), CSX (CSX), TAL Education (TAL), Vantiv, HDFC Bank, IPG Photonics (IPGP), Regeneron (REGN), and Priceline (PCLN). On average, the top names were up 18.24% over the six-month period, versus 11.68% for SPY. 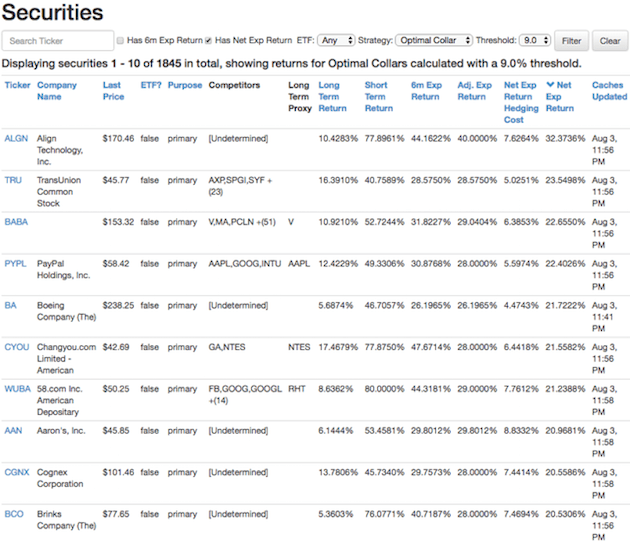 These were Portfolio Armor’s top 10 names as of July 7th, time-stamped here on Twitter: Align Technology (ALGN), Activision Blizzard (ATVI), ServiceNow (NOW), Brinks (BCO), IPG Photonics (IPGP), HDFC Bank (HDB), CSX (CSX), ILG (ILG), Regeneron Pharmaceuticals (REGN), and Bob Evans (BOBE). On average, the top names were up 19.47% over the six-month period, versus 14.07% for SPY. On average, the top names were up 28.25% over the six-month period, versus 14.85% for the SPY. 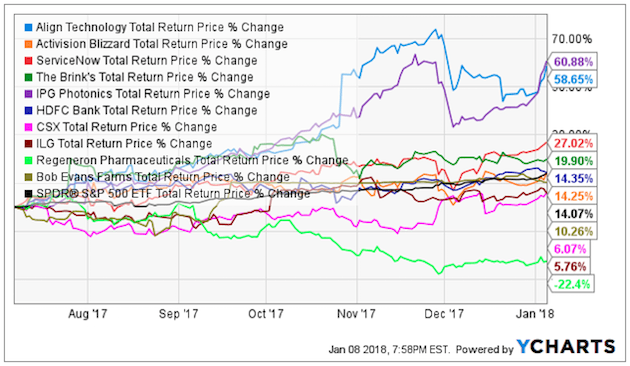 These were Portfolio Armor’s top 10 names as of July 20th, presented here on Twitter at the time: Align Technology (ALGN), IAC/InterActive (IAC), JD.com (JD), ServiceNow (NOW), MercadoLibre (MELI), Netflix (NFLX), IPG Photonics (IPGP), Regeneron Pharmaceuticals (REGN), and Cooper (COO). On average, the top names were up 25% over the six-month period, versus 14.62% for the SPY. 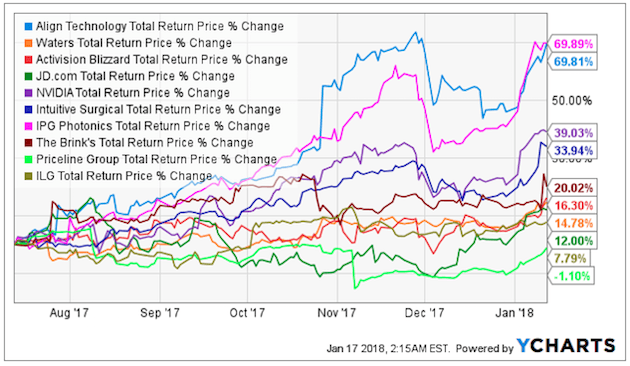 And finally, these were the top names as of July 27th, the most recent cohort to complete 6 months, presented time-stamped on Twitter here: Align Technology (ALGN), Regeneron Pharmaceuticals (REGN), JD.com (JD), IAC/Interactive (IAC), NVIDIA (NVDA), IPG Photonics (IPGP), Netflix (NFLX), MercadoLibre (MELI), PayPal (PYPL), and Ellie Mae (ELLI). 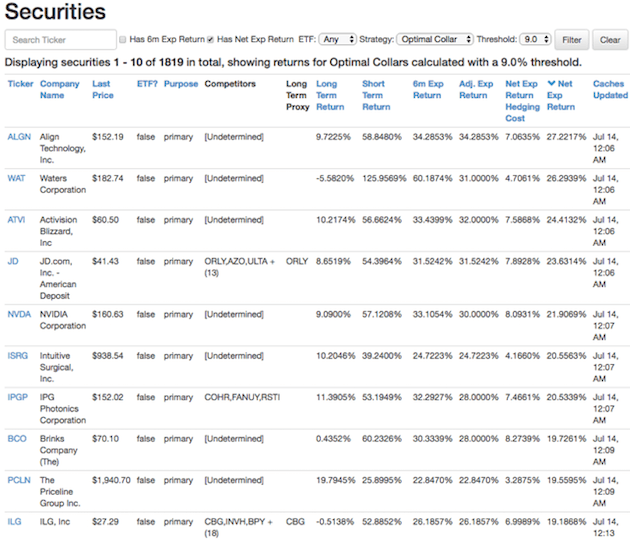 The top names were up 33.52%, versus 17.1% for SPY. 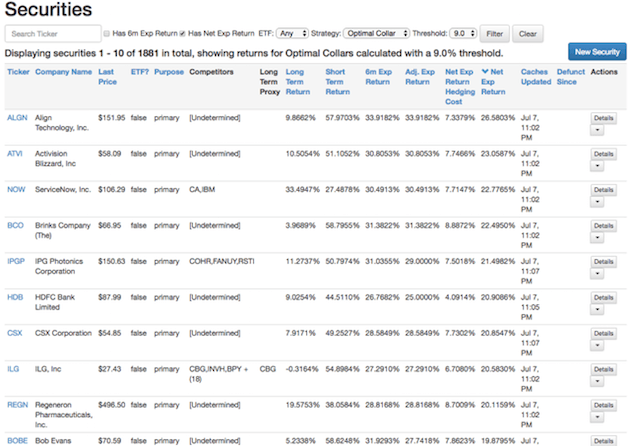 These were Portfolio Armor’s top 10 names as of August 3rd shared here on Twitter at the time : Align Technology (ALGN), TransUnion (TRU), Alibaba (BABA), PayPal (PYPL), Boeing (BA), Changyou (CYOU), 58.com (WUBA), Aaron’s (AAN), Cognex (CGNX), Brinks (BCO). 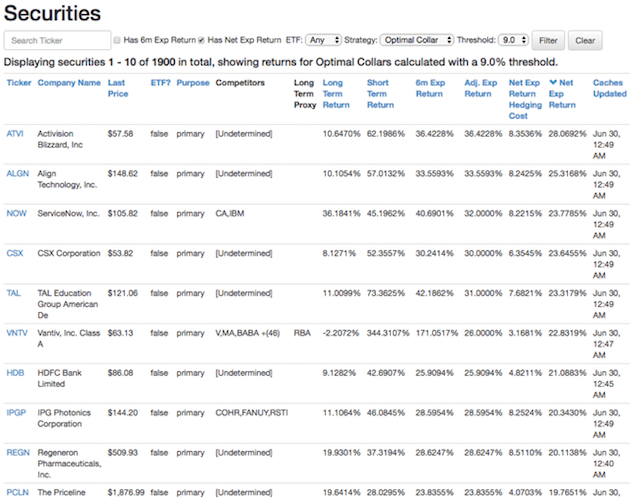 The top names were up 20.72%, on average, versus 12.66% for SPY. 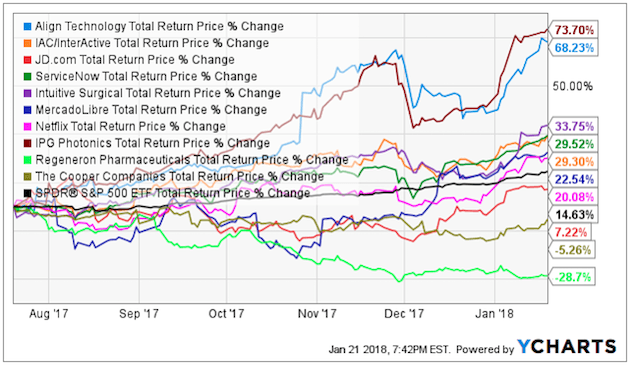 This is the 8th week in a row, and 8th week out of 9 that Portfolio Armor’s top 10 names outperformed the market over the next 6 months. 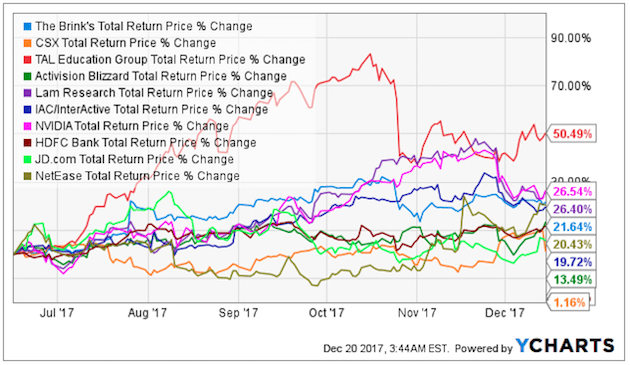 These were Portfolio Armor’s top 10 names as of August 10th: Align Technology (ALGN), Changyou.com (CYOU), Green Dot (GDOT), Sanderson Farms (SAFM), Charter Communications (CHTR), TopBuild Corp. (BLD), 58.com (WUBA), Cognex (CGNX), Alibaba (BABA), and Nvidia (NVDA). The top names were up 13.07%, on average, versus 8.56% for SPY. 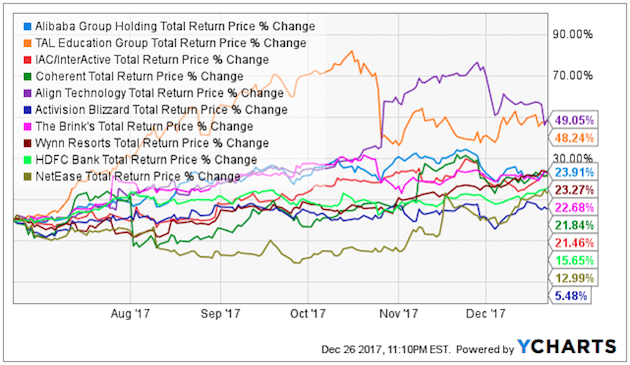 This is the 9th week in a row, and 9th week out of 10 that Portfolio Armor’s top 10 names outperformed the market over the next 6 months. 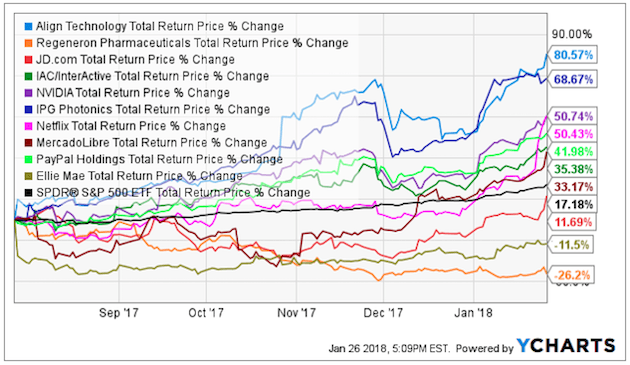 So Portfolio Armor‘s top ten names averaged 21.13% over the average of these 6-month periods, versus SPY’s average of 12.57%, an average outperformance of 8.56% over 6 months. 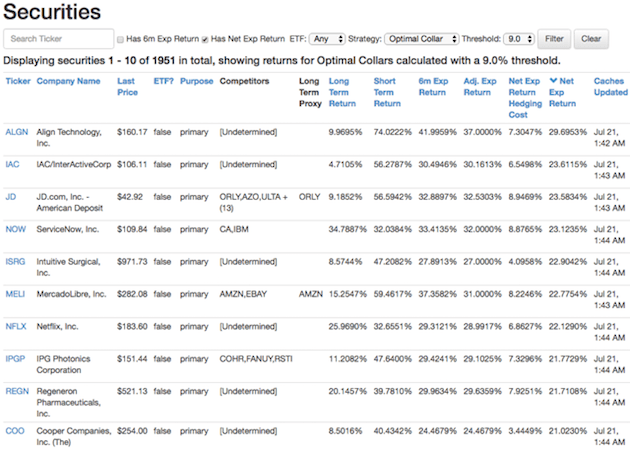 The recent real-time results above are consistent with the results of backtests my team and I ran for this security selection method several years ago. What we did was run Portfolio Armor’s daily screen every trading day from the beginning of 2003 until the end of October in 2013, and then see what the performance was over the next 6 months. Some of those days, there were fewer than 10 names that passed the site’s two screens, so the average number of top names was 9.4 per day, rather than 10. In total (multiplying 9.4 by the number of trading days from 1/2/2003 to 10/31/2013), that was 25,412 tests. 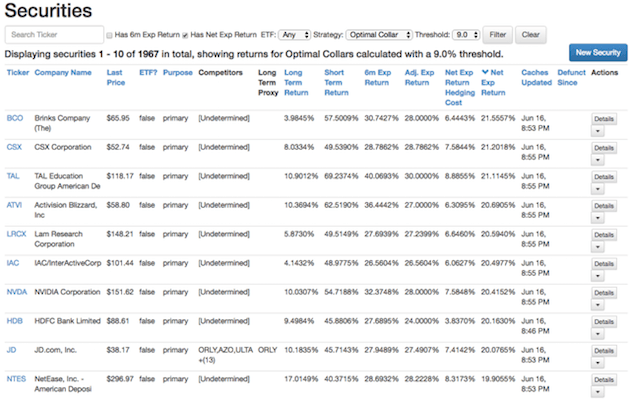 The average return for our top names over the next 6 months was 6.84%, versus 4.52% for SPY. The absolute numbers for both Portfolio Armor‘s top names and SPY were lower during the average 6 month period of the backtests than in the real time examples above from the recent bull market, but in both cases the outperformance is consistent.